Today I'm going to talk about Nicol Davd yet again. In my last post I discussed what I would work on if I were coaching this current legend of our game. And for the record, I know this isn't going to happen! It's just fun to discuss. Nicol is only human after all and can still get better at her craft. My last post got me thinking further about all of the things that I would learn from Nicol if I did happen to coach her. I also started making a list of many questions I would like to ash her. Without a doubt getting to work with a top player like Nicol would be extremely motivating and inspiring for a coach. Certainly she would be teaching the coach as much or more than we would in return. So here's a little list of what I would love to ﬁnd out about Nicol. Her training schedule: I think everyone wants to know the ingredients for the top players. What are they doing that allows them to become so great? How much of what is she doing and how has this changes throughout the years? How does Nicol stay fresh and hungry day in and day out? Her mental training program and ability: without a doubt Nicol is one of the most mentally tough and consistent players. It seems like she never loses her focus and doesn't get involved with the ref. her psychological skill set is as good or better than any other area of her game. So how did she get to this point? Was it how she was brought up by her parents or coaching? How much time does she spend working on these areas of her game nowadays? Solo hitting routine: anyone who watches Nicol in the knock up for one of her matches can tell that she has done a lot of solo hitting. She is so strong on the volley and hits such a clean ball. I think solo hitting is essential to becoming a great player. How much does Nicol do and what area does she focus on when she's doing this? How has she been able to stay healthy: having a run like Nicol is at the top of the women's game is amazing. Not only because of her ability to stay so consistent with her form, but also because she's been able to stay healthy and on court. We all know the troubles that Ramy and many other top pros have dealt with. Does Nicol play through small nagging injuries or does she have an unbelievable physio and conditioning team to keep her on court and raking up ranking points? What drives her: all top players have had long stretches of time where they were very motivated, but things change over time. It appears that Nicol has stayed hungry (and extremely hungry) and had an insatiable appetite for success. How has she dealt with low motivation? What keeps her working hard and wanting to be the best? Maybe if she writes a book when she retires we'll get to learn more about this side of her. Her future goals and aspirations: what does someone want that had already done everything? If squash gets into the Olympics there's no doubt that would be her #1 goal, but what else does Nicol want to do on tour? And I'm also curious how much better she thinks she can get. Her plans for post professional squash life: I'm sure Nicol will continue being involved with squash in some way after she retires. Does she know I'm what capacity yet? Does she already have some offers on the table? Maybe we'll all just have to wait until this day comes to ﬁnd out. Hopefully it won't be anytime soon! complete match? What was her best victory? What is her favourite court? How much does Nicol feel her game ﬂuctuates tournament to tournament? What was your support like as a child: growing up a small girl there must be times when adults were trying to keep your dreams in check. What was her support like? Did people ever tell Nicol that she was too small? That she couldn't do what she's done? When did she realize she could become a world champion: what age or at what poky did Nicol realize she could become world #1? Did she always believe this as she was growing up or is this something she only realized after she began getting some results? I'm sure she didn't get to where she is by accident! Who is her favourite player to watch (past or current): who does Nicol learn from watching play? Or who did she grow up idolizing? I wonder if this person plays or played at all like Nicol does. How has her game progressed since she was a junior: how did Nicol play as a junior compare to now. Mess she always so disciplined? Did she always win? Was she always so in control of her emotions? 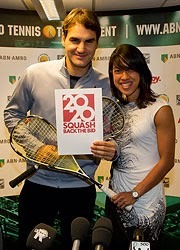 Who is her favourite player to compete against: Nicol has a few good rivalries in the sport. Which player does she enjoy playing against the most? And which is the most challenging to play? How does she keep balance in her life off the court: what does Nicol do outside of squats training and tournaments? Does she have any balance in her life? Does she play other sports? How much time off does she take to keep her fresh? How long does it take for her to get over a loss: Nicol doesn't lose often, but when she does how long does it take for her to get over it? Does she dissect the matches she loses more than the others? I'd also be curious about how many matches Nicol plays outside of completions? And does Nicol play men or strictly women since that's who she competes against? What are her favourite drills and condition games? What shot is she working on most these days? As I mentioned above it would great if Nicol could just write a biography and answer a lot of these questions. She's such an asset to our sport that I hope she isn't going to give up her squash racquet for book writing for a long time to come. To become the best in the world at anything requires a complete dedication. Certainly Nicol doesn't have some unbelievable genetic athletic quality to explain her success. It's more about her drive and what's between her ears. This is why Nicol is an excellent role model for all of us. If we really want something and commit to it fully we can do anything we want and be successful. There will always be tough times where we doubt our own ability or desire. I'm sure Nicol has had to deal with these challenges along the way. Yet somehow Nicol has managed to overcome the odds and become the most successful player of all time. ask. Undoubtably her supporting cast is extremely important to her success, but I'm sure Nicol is in control of her daily training routine. It also appears that Nicol is humble and grateful which is a unique trait for someone that's had so much success; this is likely why Nicol David has so many fans all over the world. I think the biggest thing if you got to work with someone like Nicol David is that she would make you better at what you do. It's not often you get to work with an athlete who is as or even more driven than the coach! Besides all of the questions I'd have about her training it would be her daily routine and personality that would be the most fascinating. Just as I've learned from other top coaches, it's by being around them on a daily basis that you pick up little tidbits here and there that set them apart from the pack; I think there would be a lot of these moments in Nicol's camp. It looks like you are a junior coach, do you coach any of the top Canadian juniors?